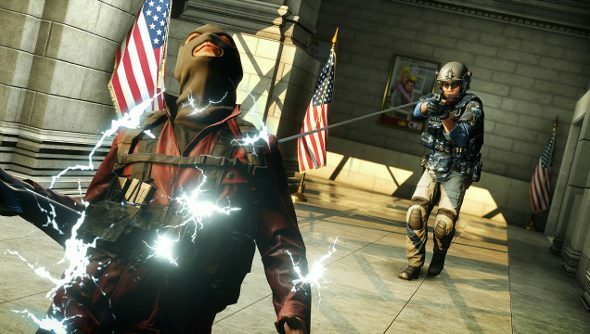 EA and Visceral have been teasing the Battlefield Hardline open beta for a wee while now, but now we’ve got dates: it’ll kick off next month on the 3rd and run until the 8th. Three maps and modes will be available for games of cops and robbers, and full character progression. There won’t be a progress cap during the beta , so while you’ll be restricted to Conquest, Hotwire and Heist modes on the Downtown, Dustbowl and Bank Job maps, you’ll still be able to unlock all the classes and gear. Hardline’s beta will also introduce Hacker mode, which is essentially the spin-off’s version of Battlefield 4’s Commander mode. Each team can be assisted by a player who is able to take control of security cameras and direct their team to attack or defend specific areas. The first beta, last year, didn’t impress, and led to Visceral delaying the game and going back to the drawing board. The developer promises big changes, so it might be worth jumping in to see what’s been improved.